MV Edinburgh returned to Cape Town on 23rd May 2016 following mechanical problems, but resumed again from Table Bay after successful repairs. Following some mechanical problems, the Edinburgh has had to return to Cape Town. She was 403 miles east of Tristan when the decision was taken (on the evening of 30th May) and it will take 6 days or so to return to port. The Tristan Government is working with Ovenstone to mitigate against the inevitable disruption there will be to the schedule and to the travel plans of passengers to / from the island. Ovenstone has decided to contract a tug to go and assist MV Edinburgh. 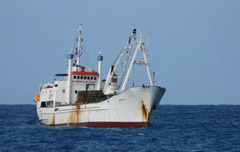 The Smit Amandla is due to leave in the next hour or so and will take about two days to rendezvous with the Edinburgh. She will have spares on board and have towing capability. The ship is currently doing 6 knots. Sean Burns has spoken to those aboard, and, though frustrated that they have to return to Cape Town, are all well. 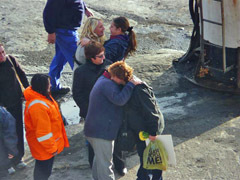 Sean Burns received confirmation from Ovenstone that the tug Smit Amandla sailed from Cape Town late on Friday evening. The tug's engagement is a precautionary measure as MV Edinburgh is proceeding under its own power and there is no immediate danger. The Smit Amanda provided assistance during the clean-up operation after the MS Oliva wreck disaster and is shown in this picture from Sean Burns taken as it arrived at Tristan on 21st March 2011. Sean Burns reports at 19.00 BST that the tug Smit Amandla is now 480 miles from the rendezvous position with the Edinburgh with a current ETA of the early hours of Monday 3rd June. The plan remains to stand by and assist (rather than tow) the vessel back to Cape Town, the ETA of which is currently estimated to be Friday 7 June. This news clearly has a knock on effect on the shipping schedule, which we expect to be revised. MV Edinburgh departed from Cape Town on Thursday 23rd May for a voyage expected to take six days. 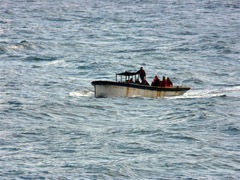 The vessel turned round on Thursday 30th May so has now been at sea for eleven days. It was hoped that the tug Smit Amandla would arrive to assist today, but some heavy weather slowed the vessel down. The rendezvous is expected during the early morning of Monday 3rd June. Ovenstone are hoping to publish a revised shipping schedule in the next few days. MV Edinburgh was built in 1970, and was previously named MV Hekla after the active Icelandic volcano. 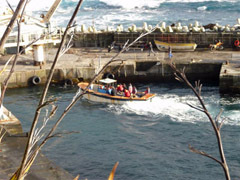 She entered Tristan fishing service in the 1980s, has a crew of 35 and can carry 12 passengers. The ship is 1085 gross tonnes and 62.5 metres long. Further details of MV Edinburgh nd other scheduled ships can be found on our Ships Page. Archive photos of MV Edinburgh arriving at Tristan (left) and at anchor off Tristan. The tug Smit Amandla is now 129 miles from the Edinburgh. Despite challenging weather conditions, she is making good headway and they are expected to rendezvous at 0800 tomorrow morning. The vessels are in regular contact with each other and reports from the Edinburgh are that all are well. Passengers aboard MV Edinburgh are the new Education Adviser Carl Lander, his wife and two children, locum Medical Officer Dr D'Silva, an Ovenstone factory engineer, Sean Burns' daughter Kelly, Ian Cramman (Tristan Desk Officer at the Foreign and Commonwealth Office), plus islanders Shaun and Renee Green and Glynis Swain. The Smit Amandla met up with the Edinburgh at 10.15 this morning and will now accompany the vessel back to Cape Town with an ETA of Friday. There are spares on board, which they hope to transfer as soon as the weather allows. This is a great relief to all. Islanders and friends are grateful that MV Edinburgh is in the safe hands of Captain Clarence October who was awarded an MBE by Her Majesty the Queen for his services to the community of Tristan da Cunha. He was previously the first mate and has been coming to Tristan since 1997. 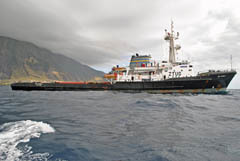 MV Edinburgh is the main supply line to the island and brings passengers and cargo to Tristan six times a year. 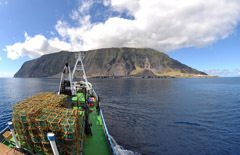 The vessel also fishes for Tristan’s famous lobster at the islands of Gough, Inaccessible and Nightingale. She has a crew of 42. See the Government News Page for more on Captain Clarence. The ship is next scheduled to depart Cape Town Tuesday 11th June (subject to arrival of spares and completion of repairs). This trip is effectively a repeat of the sailing that departed on 23rd May that was aborted following mechanical problems. 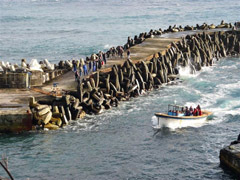 The first extended fishing trip is still scheduled to depart on 20th August as previously published. Report from MV Edinburgh 17.00 GMT on 3rd June confirms the vessel is currently doing 6 knots, 494 miles from Cape Town and ETA is currently 0500 on Friday 7th June. It was not possible to transfer spares from the tug Smit Amandla on Monday but an attempt will be made to do this on Tuesday 4th June. MV Edinburgh stopped this morning, 413 miles from Cape Town, to allow spares to be transferred from the tug Smit Amandla to carry out repairs. These repairs were successful as engineers have fitted the spares. MV Edinburgh is now underway again and achieving a speed of up to 9 knots so the revised ETA at Cape Town is now 16.30 on the afternoon of Thursday 6th June which is good news especially for passengers who have already been on board for twelve nights. The Smit Amandla will remain with the vessel until they are satisfied that the repairs have held. Throughout the MV Edinburgh has proceeded under her own power and has not been in tow. Meanwhile, on Tristan, the impact of the MV Edinburgh turn-around is having an effect on essential supplies of foodstuffs. The island Store is rationing flour and milk, whilst stocks of tea have sold out. Reporting this morning, Dawn Repetto added 'The children are longing for fruit as we have been out of apples and oranges for quite a while.' 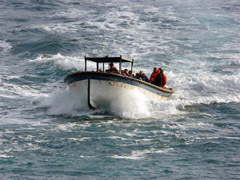 Acting Administrator Kobus Potgieter has also reported that with the fresh produce and perishables aboard the MFV Edinburgh will be inspected when the vessels arrives in Cape Town, and replaced if required. The last delivery of fresh produce and mail was the previous MV Edinburgh voyage which arrived ten weeks ago on 26th March. Islanders will have to wait a further fortnight, 12 weeks altogether if MV Edinburgh arrives as planned on 18th June. MV Edinburgh was 217 miles from Cape Town and doing 9 knots in good sea conditions at 08.00 so ETA likely to be earlier than the 16.30 planned arrival tomorrow, Thursday 6th June. The tug Smit Amandla was still shadowing the Edinburgh and hopefully the convoy will see Table Mountain tomorrow morning. 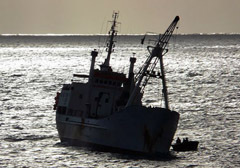 Sean Burns received a message 09.00 GMT that MV Edinburgh had safely docked in Cape Town after the aborted trip to Tristan which began a fortnight ago. Passengers will be relieved to be on dry land and we await news of when they may continue their outward passage to Tristan, earlier planned for next Tuesday 11th June. 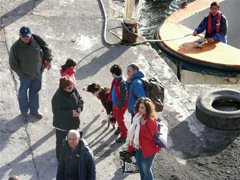 MV Edinburgh passengers are all well and most are spending the weekend at Tristan House in Cape Town. MV Edinburgh is now planning to depart for Tristan a day earlier than planned on Monday 10th June. Dorrien Venn from Ovenstone is pleased to advise that the necessary repairs have been carried out with the MV Edinburgh completing successful sea trials this morning. Departure Cape is now scheduled for 16.00 on Monday 10th June. Dorrien Venn reports that MV Edinburgh left Cape Town at 14.30 local time today with fair weather expected over the next few days. So the voyage, which first left Cape Town on 23rd May, resumes with a repaired ship and a group of passengers who we trust enjoyed a good Cape weekend. We wish them and their ship well for a good passage to Tristan where we do hope they will arrive safely and relatively quickly. 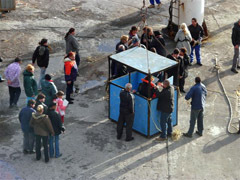 The ship will be scheduled to take seven days and will need good local conditions for a prompt landing. Nevertheless, if any voyage deserves good weather with a following wind, the possibility of a six day transit and an immediate landing of passengers, it is this particular sailing. Bon voyage. 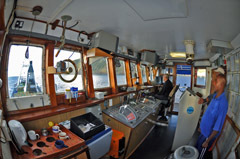 Captain Clarence reported from aboard the ship at 07.10 today that everything aboard the ship was running OK. The ship was currently doing 7-8 knots and has 895 nautical miles to go of the 1515 nm total journey. The ship's actual position was reported as Latitude 35'10.11 S; Longitude 05'58.33 E.
Editor's Note: Miles and Nautical Miles are often confused. Nearly always ships report in Nautical Miles as their speed in knots directly relates - ie a ship travelling at 5 knots covers 5 Nautical Miles in an hour. Other distances on this website use always statute miles or kilometres. We won't speculate on ETA at Tristan for the Edinburgh but hope for the best. Captain Clarence reported from aboard the ship at 07.22 today 'that all was good this side'. The ship was currently doing 10-10.5 knots and has 474 nautical miles to go of the 1515 nm total journey. At this speed the Edinburgh is likely to arrive at Tristan on Monday 17th June . Tristan Head of Communications Andy Repetto has been in contact with Captain Clarence October aboard MV Edinburgh this afternoon and the vessel is expected to arrive at Tristan 16.00 GMT. Unfortunately sea conditions in Calshot Harbour will prevent landing passengers today and so the ship will seek the lee probably at the ENE of the island north of Sandy Point in the area of Blacksand / Halfway Beach. 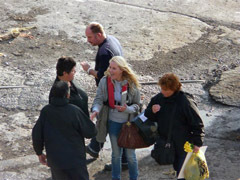 Conditions look more promising for Tuesday 18th June and it is hoped the ship's journey from Cape Town to Tristan, which initially began on 23rd May, will then be complete so passengers can make it to the island at last. 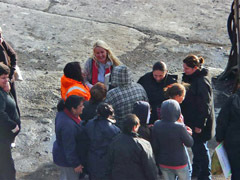 Andy Repetto reports the great news that passengers were safely brought ashore from MV Edinburgh at 09.00 GMT today after their epic voyage which started 26 days ago as the ship first left Cape Town on 23rd May. of great relief and celebration.